The first stretch goal has been hit for the Pillars of Eternity II: Deadfire Fig campaign. We thank you all so much for the support! We've also listened to you all and are showing off the next two stretch goals from now on. 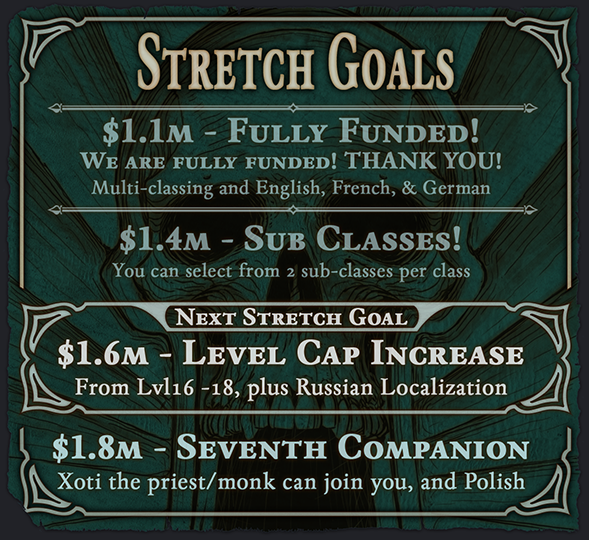 With these stretch goals we'll be raising the level cap in the game from 16 (set by The White March expansion) and adding in Russian localization, as well as adding in a new companion, Xoti, and adding in Polish localization. To learn more about our stretch goals or to support Deadfire, head on over to our Fig page.